By now, everyone is aware that, far and away, my favorite sushi restaurant in the capital region on NY is Sushi Tei, located on the side of the strip mall at 1800 Western Avenue in Albany. By now, everyone is also aware that, although I write frequently about carbohydrate heavy meals that I have been recently enjoying, I am on a high protein and low carbohydrate diet for 80% of the time. That makes it difficult to eat at a place where I love the sushi so much. However, I have found a number of menu items that allow me to enjoy the superiority of the fish at Sushi Tei while sticking to the diet. After work one evening, I met Cassie at Sushi Tei for dinner. On that day, I was really tempted to stray from the plan and order some rice-heavy rolls. I found the tuna tataki. 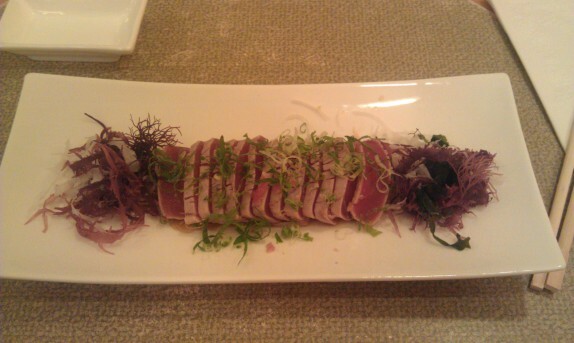 The menu describes it as “Seared tuna thinly sliced w. ponzu sauce,” and that’s just what it was, no mucking about. The tuna was fresh, lean, and soft. The ponzu sauce was tangy and sweet. Let’s put it this way: it beat the living tobiko out of boring sashimi. I love it, and for $10 bucks, I challenge anybody to find a portion of tuna that big anywhere in the area for that price (well, anywhere that isn’t all-you-can-eat). I did stray just a touch for the spicy crab salad. 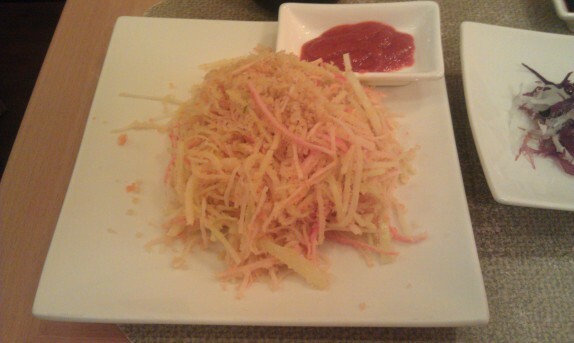 This is a tossed salad of imitation crab, fresh cucumber, tobiko roe, panko crumbs, and a sauce they call spicy. As you can see from the image, I ask for Siriacha on the side to actually make it spicy, because it’s really not, at all. It is great though. The panko, which is where I strayed, add a much needed crunch and bring the dish together. This was $5 or so, not bad at all. For dinner, I ordered the spicy tuna nanuto-R roll. This is really cool. 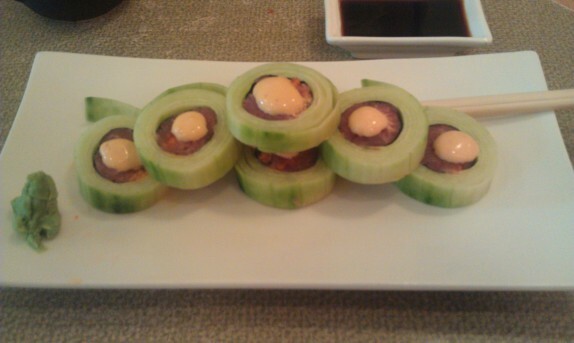 The fish is rolled around a thinly sliced sheet of cucumber and then topped with a spicy mayo. Add to the equation the derryX sauce [where you take the whole chunk of wasabi they give you, put it in the little dish they give you with about 1/2 teaspoon of soy sauce, and mix until combined] and you have a delicious, low carb alternative to sushi. Crunchy, fresh, spicy., anything you could ever ask for. So awesome. The best part is that it’s only $9. So, for under $25, I ate a rather modest, healthy, protein-packed meal, with no rice at a sushi restaurant.